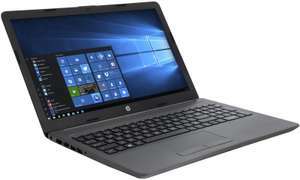 HP 14-cm0026na Laptop, AMD A9 Processor, 4GB RAM, 128GB SSD, 14" Full HD, Smoke Grey. I am after a new laptop, but I can't find any online reviews. So any advice please? Bargain price for a brand new laptop Not the fastest in the world but great for email and surfing. Windows 10 will be horrible on this but Cloudready, (Chrome OS,) may be fine. These are not worth th money. Buy a real laptop. A second hand eBay refurb would be cheaper and more capable. My partner used hers for a month and then put it in a cupboard where it is growing cobwebs. Not a bad price for this cloudbook. Heat added. It may have been that price in Feb when you posted, but sometime after that date it went up to £549.99, which it was on-line on 9th April when I started looking at laptops. When I went in store on 10th the ticket price was £549.99, but the assistant noticed the price had dropped overnight when checking stock levels. I was just glad I hadn't ordered it on-line the day before. Although JL has a pricing policy that if the price drops within 28 days of purchase they will refund the difference, so I will keep monitoring the price for the next 4 weeks. Is the ram dual channel? Non backlit, sorry. That's ok but I think this is still too pricey. Has been cheaper from AO previously. I did see it, but have heard such poor reports about Curry's tech support and customer service, I'd prefer to go with John Lewis with it's 2 year warranty. 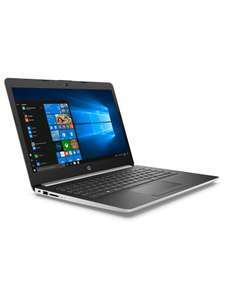 Can you comment links to the better laptops please. £279 is a good price currently for same spec but with Pentium CPU. So at £100 more for a roughly comparable CPU this is not a good price. Bought one of these, that are supposedly A1 graded, which by their own words means "as new". I didn't even manage to get through windows setup before the fan started to fail spectacularly, which brings into question whether they even test the "refurbished" systems they're selling, let alone refurbish them. Either that or they have extraordinarily low quality assurance standards. Have submitted a return request, will see where it goes from here. I would strongly urge avoiding this deal for the time being. Update: Still waiting for them to even action my return request, most likely gonna have to repair the laptop myself. Their customer support is the worst I have ever dealt with, they were faster to send me an email about upgrading to their extended warranty than they were to actually honour said warranty. Hopefully this will save someone a lot of time and money, especially someone without the knowledge to do laptop repairs for them self, as you'll receive no support from this company seemingly after they have your money. Mine came yesterday too, great machine. Does your capslock key occasionally flash when starting up then the computer doesn't boot? I've flashed a BIOS update over it this morning but can't test extensively because I'm at work. Also when in tablet mode if I tilt the device it sounds like the fan starts groaning. SSDS are cheap at the minute. Could pickup a 500gb SSD for £50~ https://www.hotukdeals.com/deals/western-digital-wds480g2g0a-wd-green-ssd-solid-state-drive-480-gb-internal-25-sata-6gbs-for-4499-delivered-amazon-uk-3206124 Ignore me it's m.2 apparently. Seems like a good deal but not much heat here and still in stock. Wondering what do people think is wrong with that deal? Such a great deal - and very happy with the laptop! Great laptop, great price. ideal for my gaming needs as well as home study requirements. Def recommend! Just checked and deal is still active until midnight today. Not sure what you're seeing? You know you have to apply SAVE12 e-voucher right? Was this £600 on the HP store? I started looking around in September/October and it's been at £699 on the HP Store every time I've looked except for Black Friday. We bought ours from Amazon at £649 and the price has been as low as £649 or £640 if you include marketplace sellers according to camelcamelcamel. The build quality on this model is very good. The Pavilion range is certainly built to a price and best avoided IMO, but there's nothing wrong with the build quality on this laptop. Hinges are solid and smooth. Material quality is fantastic and compares favourably with more expensive laptops. Is HP build quality good enough to risk £650 on a convertble? Or will it break or begin to fall apart at Warranty + 1 month? Never miss a 'HP Laptop' deal again! 8th gen i5, 8GB RAM and SSD for under £300. Anybody else ordered this? Can you comment on the quality of the product received? Ah damn it, if only it had numeric keypad. Trying to something as good as this with it is proving a real challenge! Received laptop today. Laptop performs exceptionally well. My only criticism is that this model of Pavilion does not come with a backlit keyboard. Very happy with the purchase! Thanks OP, just bought. The website shows that there are only 7 left! I did. Returned it after couple of hours testing. Been looking for a laptop. Would this be good for course work. The odd game and movies? Have one of these and the only annoying thing is the quite high pitch of the fans, which seem to run all too often, even when I don't seem to be doing anything too strenuous on it? But decent machine to be fair. PAid around this money in CPCW, but no freebies and only 12 months Warranty, so HOT for the extras alone! 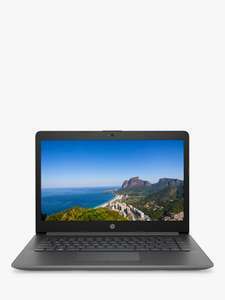 I have the 14inch HP with i5-8250U (integrated graphics) processor with same connections (including USB-C) and great battery. Screen (assuming same technology) has low brightness but great detail (1080p) and small bezel so the overall footprint is relatively small. 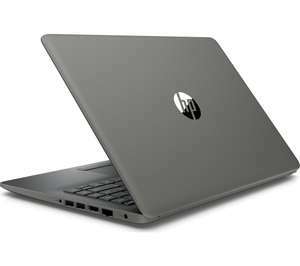 Keep an eye out for refurbs on Amazon - This was £100 less last week https://www.hotukdeals.com/deals/hp-pavilion-156-inch-laptop-5-8gb-ram-1tb-128gb-ssd-ryzen-5-2500u-refurb-38999-amazon-sold-by-electrical-deals-3201267 - There was only a couple available tho, I'm gutted I didn't get one. What would you recommend that is better, brand new for around the 450 mark? HP are sneaky in that they call their screens "SVA" panels which means "Standard Viewing Angle", i.e it's a TN display. I know that, I never said it does. I just use the best resolution on my laptop for typing or ppt and a 4K on my big screens with movies at the same time. My point is just because some people won’t benefit, other users will benefit from this. It’s like voting cold on a deal that isn’t useful for yourself but useful for others. Who needs an i7 in a small form factor? GCSE student no way. Lots of photographers and engineers who can. Not quite. If you’re media hungry and have a decent career, you can use 2K on your laptop screen while Miracast to a bigger screen. Great for presentations in lecture theatres or video in the background. Saying that..i had same issue with the first yoga c930 and had to return it for same reason. The new models at the start tend to have some problems.. Yes. I'm loving mine and so is the other half. Much better than my previous laptop. Great screen and keyboard is nice to type on. Love the face recognition to get in to Windows. Any feedback after initial usage? Can anyone recommend a pen that works with this? Thanks. Ordered 2 from Amazon. One for me and one for the other half. Our previous laptops are quite old so they could do with renewing. Yeah, the keyboard got warm on the one I had, not too bad but warm enough, I had to undervolt it to get the temps down, is your as it is out the box? Looks like it runs fairly cool, cooler than i remember, it was just under heavy load it sounded like it had jet engines attached to cool it down. Thank you, what's it like under heavy gaming? So at 25% volume on the laptop you can just about hear the fan. its there but sounds like a breeze of air rather than a whirring blender noise. Typing this now the fans are on and I can clearly hear them with no sound as they continue to bring the temps down. They took about a minute to slow down to a very quiet level, 3 minutes to inaudible/off. Personally I'm more than happy with it, bearing in mind the horesepower it contains it copes very well. Yes I don’t know why everyone is getting excited. £40 more gets you the Lenovo equivalent with the Ryzen 5 quad-core and Vega 8 graphics. Vega 3 has just 3 CUs, barely even worth it! And the HP 255 is made of the cheapest, least durable materials known to man. Yep, battery access is a pain but the other specs are very good, for new, at the price point (especially 256GB SSD and 8GB memory) so shouldn't need openning up for a couple of years at least (for that stupid battery). Please remember the Ryzen 3 2200u is a dual core part with a very weak GPU. In terms of perf it's a bit faster than a UHD 620. Don't get why this is so cold, this is a really good price for this laptop. I hear that the 2500U version with Vega 8 will throttle less and produce better performance in the basic gaming that it can do. The GPU and CPU share one TDP limit. Whereas the regular Envy with the MX150 have separate TDPs to play with. Expensive but when you consider the spec and size it’s all relative. Great price IMO! Good laptop but very expensive. INTELI710 That offer code doesn’t exist. Try another if you have one. Does anyone have another offer code available that is working please? You can turn it off in the bios from constantly running. Completely differnt class of machine and about a kilogram heavier. This is also quad core with 8 threads and will be faster if the cooling is up to. Mine arrived yesterday as well. Just had time to try and set it up. Looks brand new, Have 10 months left on warranty. Will contanct Xsonly and see what they say. So far quite happy with it, just a major hassle trying to set it up, when your not that I.T. literate. Yeah you should do! I was only menat to have 6 but that was with them not HP. Someone must have bought warranty with it when they got it. Wow! You're quite lucky, after checking it seems I only have 7 months of warranty left! I'll think about contacting XSonly about that and see what they say, as it's advertised as 1 year warranty. Check the warranty status on the HP website, i was surprised to find out i had 3 years! The previous owner must have paid for it! Arrived this morning, and as it stands I'm extremely happy with it. Beautiful, fast laptop with zero signs of prior use.